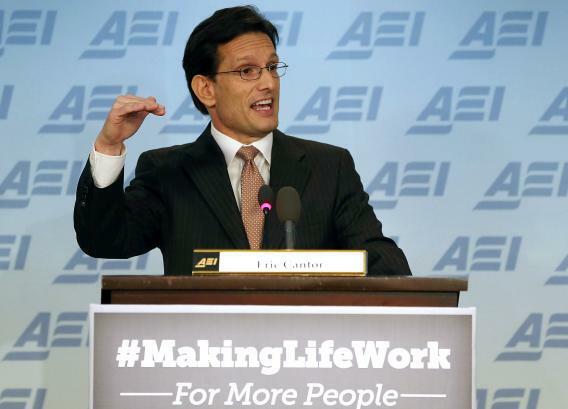 Eric Cantor AEI speech covers Republicans' wide-ranging policy agenda. -Allow private employees to use overtime hours for future leave: “An hourly employee cannot convert previous overtime into future comp-time or flex-time. In 1985, Congress passed a law that gave state and municipal employees this flexibility, but today still denies that same privilege to the entire private sector. That’s not right.” That’s new. -“Provide an opportunity for legal residence and citizenship for those who were brought to this country as children and who know no other home” … but don’t forget about “border security, employment verification and creating a workable guest worker program.” Also somewhat new, because in the current context, any warm words like these amount to a wink at immigration reform. -Repeal parts of Obamacare such as “the new taxes that are increasing the costs of health care and health insurance, like the medical device tax.” Not at all new—part of Republican budget-cutting efforts since 2011. -End Medicare’s “arbitrary division between Part A, the hospital program, and Part B, the doctor services. We can create reasonable and predictable levels of out-of-pocket expenses without forcing seniors to rely on Medigap plans.” The return of the “replace” element of “repeal and replace”—and done without the once-standard promise to immediately repeal Obamacare. -“Provide states more flexibility with respect to Medicaid that will allow them to provide better care for low-income families in a way that ultimately lowers costs. Options for states should include streamlining the process for determining eligibility, and allowing them to offer health coverage through patient-directed health care or flexible benefit programs. And we must make it faster and simpler for states to gain approval of federal waivers to modify their Medicaid programs.” Also somewhat new!